Fundraiser for Andrew Taylor by Becki Taylor : Pop fly. Almost lost an eye. Pop fly. Almost lost an eye. I never thought I would find myself here on GoFundMe writing a personal request. Family and friends, I know you’re out there. Thank you for making it to this page. Your support will mean the world. This is Becki writing. For those of you who don’t know me, I am one of Andy’s younger sisters. Here is Andy and Courtney’s story: On Sunday, May 27th a large group of the Armbruster Clan (what we call our mom’s side of the family) made it out to the Rockies game to celebrate my cousin and her family being in town. As a member of the Air Force, my cousin was able to score us some great seats – off 3rd base about 13 rows up. It was a hot day, but the company was good and so were the hot dogs. The first foul ball of the game landed several rows ahead of us. We just entered the 6th inning and the first hit was foul. I saw it headed our way, I knew it was going to land close, but I didn’t know how close. I immediately went to a duck and cover, Andy stood tall and tried to catch the ball. I heard a loud snap behind me and turned to see my brother on his knees – facing me – his hands on his face and blood pouring between his fingers. The Rockies stadium crew responded quickly but a man attending the game, Randy, an off duty paramedic, immediately came down and started talking to Andy and gave him a quick preliminary check. When the stadium paramedic made his way to us, Randy gave him a quick rundown of Andy’s condition and we were whisked away to the medical center at the stadium. Before I go on, Randy, if you’re somehow reading this – THANK YOU. You probably don’t know how important your expertise was at that moment. I’ve never felt so helpless as I did seeing my brother in that condition. Courtney and I didn't know where the blood was coming from or what his hands were covering. We (or I) needed you and there you were. Thank you for being at the game that day. Thank you for leaving your seat to help us. I hope you were able to enjoy the rest of the game. Okay – back to the story. It was after Andy pulled my cousin’s baby blanket from his face that we could see blood coming from his nose, around his eye, and from the eye itself. His eye was swollen shut. The foul ball had traveled though Andy’s hands and hit him in his right eye. The medical team at the stadium gave Andy some pain medication and another quick evaluation. They put him in an ambulance and sent him to Denver Health. 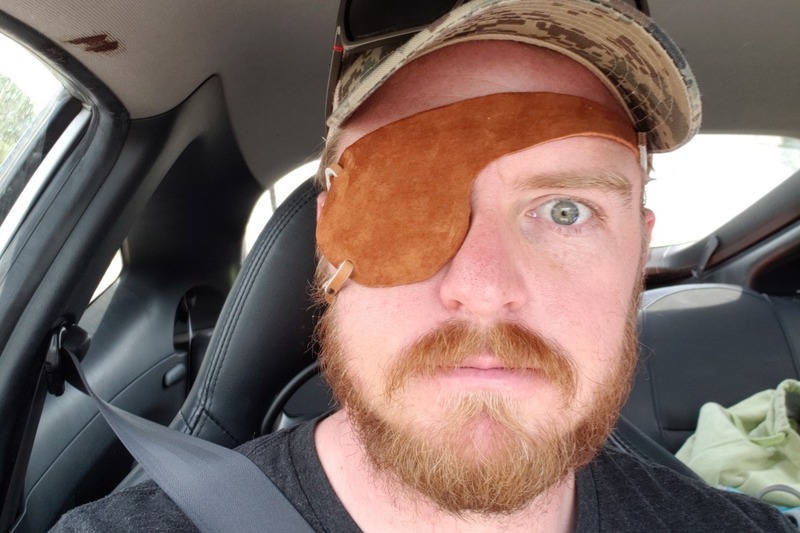 The eye trauma specialist was in Andy’s room shortly after his arrival and immediately began running some tests to rule out the need of emergency surgery, a few of the tests made my stomach turn, and Andy passed all of them. After several hours in a very busy ER and the expert care given by those incredible human beings (what an interesting place that is), Andy was able to return home. The diagnosis was this: Andy suffered from cuts from his sunglasses basically exploding on impact. Here is a picture - you can see pieces of his glasses in the air. https://www.facebook.com/302248953634954/photos/a.339384636588052.1073741826.302248953634954/339492746577241/?type=3 The bones around his eye are fractured in several places; the cheekbone area is fractured so severally that his eye is actually sitting lower in his face (I guess I shouldn’t have called him Quasimodo), so he cannot move his eye to look up. This will require reconstructive surgery. His pupil is not responding to light, it’s stuck open. There is no treatment or surgery that can repair this. We are all just hoping that it will sort itself out. 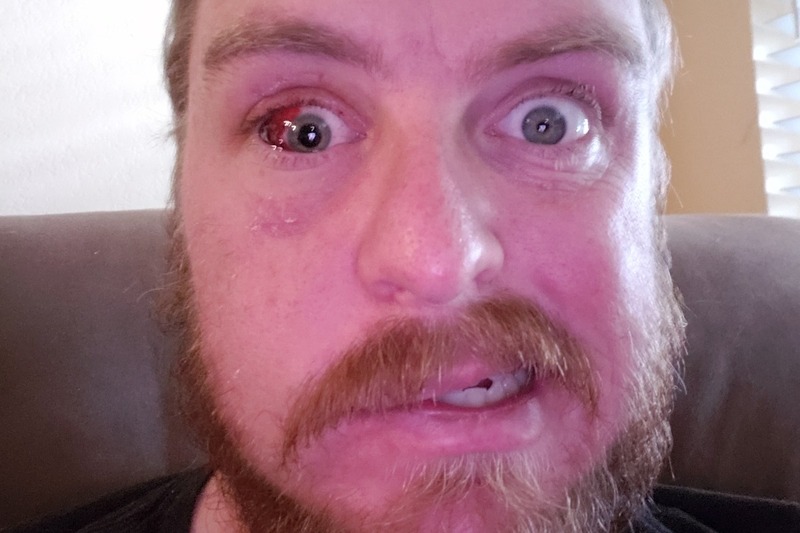 Andy had 2mm of blood pooling in his eyeball and the doctor was concerned if the pressure level spiked behind his eye, he could suffer severe nerve damage and lose his sight permanently. 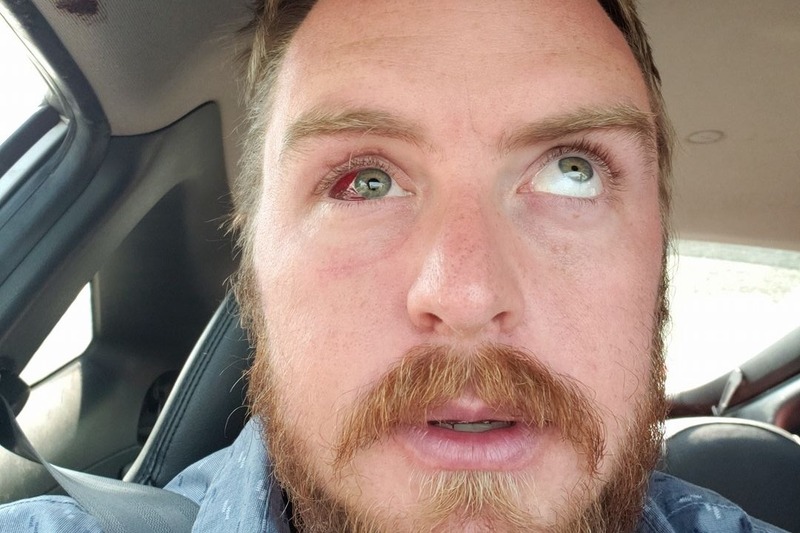 He has been sleeping sitting up to keep the blood from moving to the back of the eye, and a follow up appointment was scheduled immediately after Memorial Day to monitor the pressure and gain more insight into the injury with less swelling. Andy has some clear hurdles to overcome but, as our 6 year old nephew put it, “God put his hand in front of Andy’s face and moved the ball a little so it didn’t pop his eye out.” I am not sure if his eye popping out on impact was a real possibility, but the kid has a point. Things really could have been so much worse. That’s Andy’s story, and this is why we all find ourselves here – on GoFundMe. Andy and Courtney do have health insurance (thank goodness) but, as we all know, that doesn’t mean this is going to be inexpensive. He will be out from work indefinitely, in and out of appointments, and at least one surgery is on his horizon. But that’s not the end of the story. What you may not know is this: Andy and Courtney have been trying to start a family for several years now. After various consultations and tests, they have begun the IVF process. They have not asked for any help, they’ve made some significant financial commitments and they have been saving every penny to afford this expensive procedure on their own. Now with Andy’s injury, it’s unclear what this will do to their dreams of starting a family. I love my big brother and my sister-in-law. They are the lovable couple who have a zest for life, they bicker like 80 year-olds, and have a house too small for the love in their hearts. They never say no to helping someone else out. They bring silliness, love, and great strength to my life and many others. 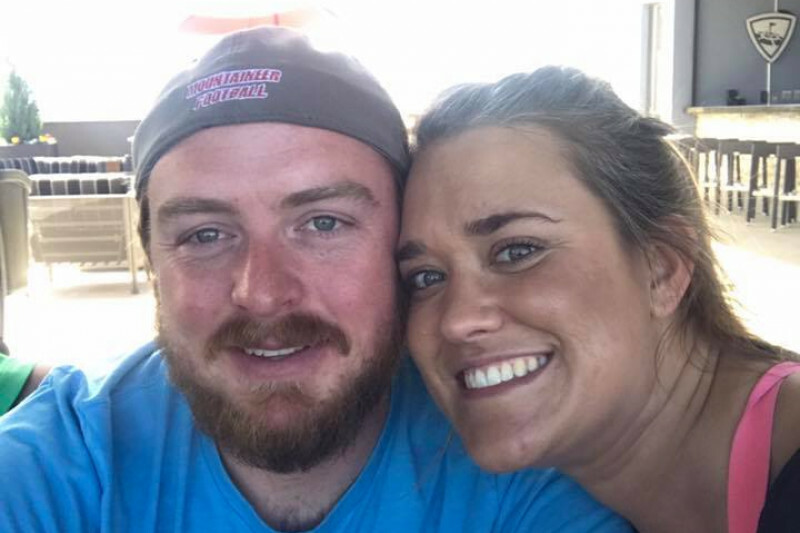 I am asking you to help support them as they are faced with some monumental challenges – paying for everyday expenses while Andy is out of work – paying for the additional medical costs associated with his injury – and paying for the IVF procedure. These are things they shouldn’t have to choose between. They are truly extraordinarily loving people; you already know this if you know them. If you’re a kind stranger who found yourself here, take my word for it! In fact, Andy is the guy who rushed in to save a school bus full of kids that had broken down on the highway and beginning to smoke, and he has probably already helped you change your tire on I-25. Courtney has already served you or your family some amazing food at one of her 3 jobs, or sat next to you while getting her undergrad degree. Please donate if you can. Whether or not you donate, please also share this story. And, if nothing else, take this as a friendly reminder to bring your baseball glove to the game. THANK YOU! I've been on the mend from surgery, and this is long overdue, but thank you so much everyone who came out last week to Something Brewery! It was great to be able to come out to the event for a bit (even though I paid for it the next couple day... worth it). Thanks again everyone! Go support the brewery, have a beer, those guys are amazing for showing the community support! About the recovery, the doctors are pleased with my progress. The only issue currently is I am still having severe double vision, which is expected to correct itself when the swelling dissipates. SURGERY UPDATE: Andy is home from surgery. He did really well. Doctor said it was a “beast” of a fracture. The orbital floor was gone. They put in a plastic/titanium piece and secured it with a screw, and he has two layers of stitches beneath the skin. They had to clear out quite a bit of scar tissue around the nerve. He has at least a 2 week recovery time, and they will have to wait and see how his muscles heal to know if there will be additional surgery. That surgery would be minor compared to this one. His vision will be improved, but he will still have double vision for now. They are unsure if the double vision will go away. It depends on how he heals. He is in quite a bit of pain, and the doctor said so expect quite a bit of swelling and bruising. He’s down for the count for the next 48 hours, and can begin more physical activity in two weeks (or when he feels comfortable doing so). Hello all, Andy here. We finally figured out a way for me to do updates on my own. First of all, I feel so humbled and blessed that my little mishap has gotten so much attention and support. Thank you all for any bit of help you have provided to Courtney and me through this rather surprising accident. Now I would like to give an update as to my treatment. I am scheduled for my reconstructive surgery on Wednesday, June 13th. Even though I get to wear an eye patch, I am super excited to finally (hopefully) be back to single vision. After the surgery we are anticipating a recovery time of two weeks before I will be returning to work. I may also require additional surgery depending on whether or not there is damage to the muscle, but only time will tell. Once again, I want to thank you all. Courtney and I have been working hard to start a family, and were so worried when this happened it would, once again, set our IVF process back. Thank you all for helping my healing, but more importantly keeping our dream of having a baby. I'll say it one more time, because I am so thankful, THANK YOU!! !